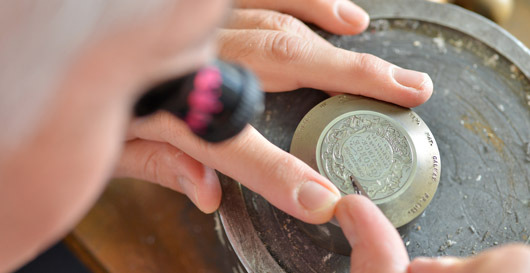 We’ve been totally mental with The Royal Mint’s PR … again. There’s something about The Royal Mint as a client. They are the most esoteric of businesses (seriously, we tell people we work with them, those people look at us quizzically). But they are also the most news-generative, exciting, publicity-happy (and publicity-friendly) people some of us have ever come across. And they give us the opportunity to do some absolutely amazing work and to deliver some utterly incredible results. The past couple of weeks has been absolutely no exception to the rule. First of all, we announced that The Royal Mint would be making a special coin to commemorate the Christening of Prince George of Cambridge. Just a simple announcement to get the word out there, mind. No images, no details. Just an announcement. The story went nuts (as we kind of hoped that it would, but had no certainty with – the whole thing was created to give ourselves a shot at coverage we might not otherwise get while we waited for the coin itself to be made). But for a “might as well give it a bash, the big news is coming” story, we cleaned up. and There were over 20 pieces across the BBC network thanks to regular news-play across the national and regional TV and Radio. Then (thanks to making the main news (ITV were playing our story out through the day). The story made across the Daily Mail, Daily Mirror, Daily Star, Standard, The Sunday Telegraph, The Sunday Express. Then there was Hello, MSN, Yahoo … you name it. Then, two weeks later, we found ourselves wrangling the world’s media at The Royal Mint itself as we prepared to unveil the design itself. With reporters and crews from SKY News, the BBC, ITN, CNBC, Reuters, PA and Channel 5, along with photographers from every agency going. In the nationals, we had a cracking show, with the Daily Telegraph, Daily Star, Daily Mail, Daily Express, METRO … and heaps and heaps of online titles and regionals, along with pieces north of the border from The Herald, The Scotsman, The Scottish Daily Express, The Scottish Daily Mail … it went bats. This time out, we outdid ourselves with over 700 pieces of coverage for the unveiling on top of over 200 for the announcement. It was a stand-out display from across the team.